The Project Reveal South-West team inventoried the house and workshop of a shoemaker immortalized in a poem by Robert Burns, unveiling his everyday life and the timeless skills of his trade. The character of Souter Johnnie became famous worldwide thanks to his appearance in a few lines of one of Robert Burns’s greatest narrative poems, Tam o’ Shanter. Burns describes him as an old friend of the protagonist, Tam, with whom he spends his time drinking in Ayr’s public houses on market days, often returning home late. Even though the story was based on an old legend, Burns’s characters were inspired by real people that he met over the years. John Davidson was the man behind Souter Johnnie, a shoemaker who lived in the small village of Kirkoswald, in Ayrshire. His cottage is now in the care of the National Trust for Scotland. The cottage was built in 1785 by John Davidson himself and he lived there, with his wife Anne and their children, until his death in 1806. Souter Johnnie’s Cottage stayed in the Davidson family until 1920, when it was handed over to a committee which oversaw its restoration. It was then passed to the National Trust for Scotland in 1932. 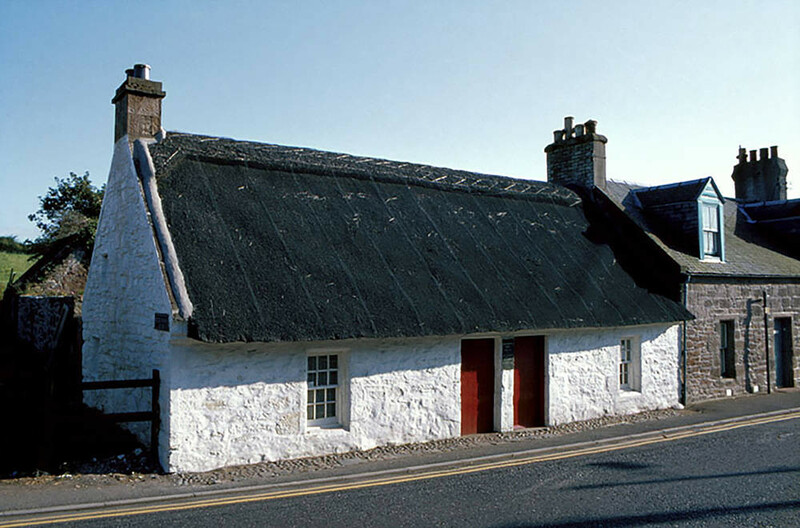 The building, a lime-washed single-story thatched cottage, is considered to be a fine example of a traditional form of Scottish vernacular domestic architecture – very few examples are still in existence today. The cottage features two large front rooms and, above them, a large loft. The living room was where all the domestic tasks took place as well as where some of the family slept. The attic, originally accessible by wooden stairs and which still has a fireplace at each end, was another space where visitors, or even the children, may have slept. The front room was mainly a reception room where friends were entertained and where, most importantly, customers were served and tried on their new shoes or boots. The most unusual room, John Davidson’s workshop, is an extension at the back of the cottage. In the 18th century most shoemakers had workshops in their homes, making it easier for their wives and children to help with the business. This was a time when every step of the shoe-making process had to be carried out by hand. Different tasks were often performed by different people, using diverse tools. Customized wooden and cast-iron lasts of various shapes and sizes were used as molds around which the shoemaker fashioned the shoe. After measuring the customer’s foot, the cobbler translated those calculations onto a pattern and then cut out – or clicked – the leather using a skiving knife. The hide then went through a series of processes that made it easier to shape. A marking wheel was used to mark the spots where holes would be poked in the leather with various types of awl. A waxed linen thread was used to ‘close’ the shoe together and attach the sole, after which the shoemaker would create a heel by nailing several pieces of thick leather to the sole. The final steps were to seal the edge of the sole and the heel with a burnishing iron, and to polish the leather with a glazing iron and sleeking tools. Souter Johnnie carried out all these tasks in his small workshop, working by the light of a candle and the warmth of the fire, with a bird keeping him company as had been customary since the Middle Ages. A well-trained shoemaker like Souter Johnnie could complete a pair of shoes in 8–10 hours, producing his wares mostly for local men. However, this level of output soon proved inefficient and by the end of the 19th century shoemaking factories started to replace small family businesses. The interior of Souter Johnnie’s Cottage was converted into an art gallery in 2014. However, in the atmospheric surroundings, and with the help of displays of shoemaking tools, it is still possible to admire the skillful art of the souter. This article is by Alice Maraner of Project Reveal Team South-West. Project Reveal is a multi-site digitization project of unprecedented scale. It will result in an updated database with high quality images and unique object numbers for every item in the Trust material culture collections. With your support, we can help the Trust manage its collections more effectively. Most important, we can help the Trust discover, better understand, and share its treasures with the world. This article was originally published by the National Trust for Scotland on April 20, 2018.